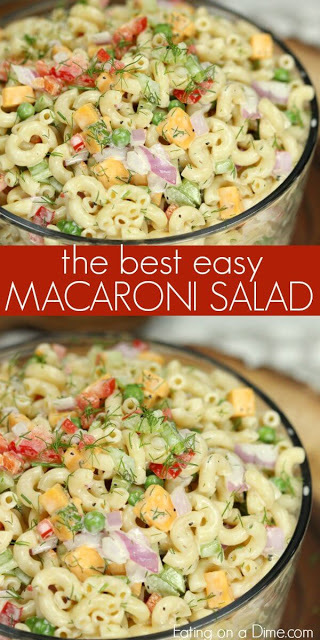 This Easy Macaroni Salad Recipe is super easy and everyone always loves this salad. I'ts budget friendly and makes feeding a crowd a breeze! It’s creamy and delicious. The veggies combined with the cheese really make this simple side dish hearty and tasty. Cook the elbow macaroni until al dente. You want them still firm. Immediately run the pasta under cold water so it isn't sticky and prevents it from over cooking. Drain well. In a large mixing bowl, toss together cooked pasta with the cubed cheese, onion, celery, bell pepper, and peas.